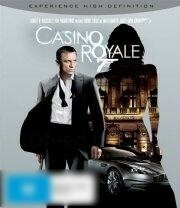 Synopsis: Bond is back! And Daniel Craig "is the best Bond since Connery" in this "leaner, meaner, back-to-basics re-boot" of the original secret agent in Ian Fleming's classic - Casino Royale. From the director of Goldeneye and co-starring Eva Green and Judi Dench, this 21st instalment in the 007 franchise is straight from its highly successful cinema release and with wall-to-wall action and heart-stopping thrills.